Shiloh is a Newbery Medal-winning children's novel by Phyllis Reynolds Naylor in 1991. Naylor decided to write Shiloh after an emotionally taxing experience in West Virginia where she encountered an abused dog. This novel is the chinese translation. Soft cover. This is a story about the love shown by a young boy towards a stray dog. Families who are animal lovers may love to share this story with their young ones. 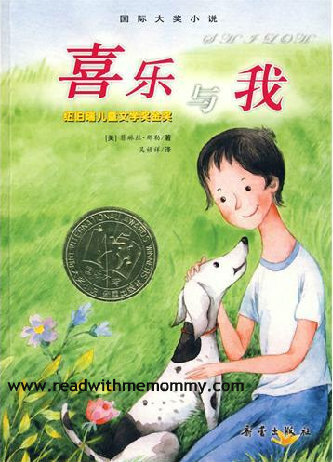 Note: We would recommend this title for children who has achieved an intermediate to advance level of Chinese. Available in paperback, simplified Chinese. No coloured pictures as this is a short novel. The novel is set in the small town of Friendly, West Virginia, where an eleven-year-old boy named Marty Preston finds a stray beagle wandering in the hills near his house. The dog follows him home, and Marty names him Shiloh, a tribute to a neighborhood schoolhouse. Shiloh's real owner is Judd Travers, who owns several hunting dogs. Judd drinks and treats his hunting dogs poorly. Fearing for the dog's safety, Marty does not want to return Shiloh. However, his father insists Shiloh be returned to his owner and they take the dog to Judd Travers. Shiloh returns to Marty who hides him from his family. Concealing Shiloh in the woods in a wire pen he builds, Marty smuggles some of his dinner to the dog each evening. After his mother discovers Marty feeding the dog, he persuades her not to reveal the secret. That night, Shiloh is attacked by a German Shepherd Dog while in his makeshift cage and his family discovers Marty has been lying and hiding the dog. After taking the dog to the town doctor, the family must return Shiloh to his rightful owner. Before doing so, Marty travels up to Travers' house to try to convince Travers to allow him to keep Shiloh. Judd does not see Marty approaching, and shoots a doe out of season, which would mean a stiff fine Judd cannot afford. Marty lets Judd know he knows, and attempts to blackmail him out of Shiloh. Judd and Marty eventually negotiate a deal in which Marty will earn Shiloh for 40 dollars, paid with 20 hours of working for Judd. At the end of the first week, Judd says that he will not keep his end of the deal because the evidence of the dead doe has with the passage of time disappeared. Second, the contract that Marty had him sign is worthless in the state of West Virginia without the signature of a witness. Despite Judd's pointed disapproval of his work, Marty continues to work for him. They begin discussing dogs and Judd's father who began physically abusing Judd when he was four years old. In the end, Judd warms to Marty, relents, and lets him keep Shiloh.